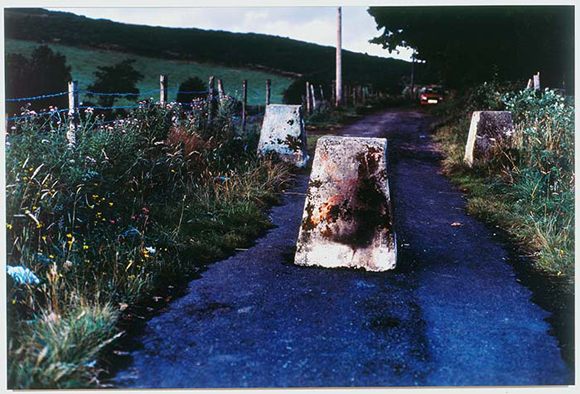 Willie Doherty, Border Road, 1994. Cibachrome photograph, 122 x 183 cm. Image courtesy of Alexander and Bonin, New York; Kerlin Gallery, Dublin; Galerie Peter Kilchmann, Zurich; Matt’s Gallery, London; and Galeria Moises Perez de Albeniz, Madrid. “Unseen,” the title of Willie Doherty’s first retrospective in his hometown of Derry, refers to a complex set of impossibilities at the core of his photographic and video practice. 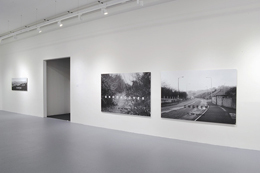 The exhibition is accompanied by a substantial, three-hundred-page catalog in which Robin Klassnik, the director of Matt’s Gallery in London and co-curator of the exhibition, asserts that “Unseen” refers to Doherty’s need to make work in such a way as to remain out of sight, unremarkable to the all-seeing eyes of the British military that has so famously surveilled Northern Ireland and Derry. “Unseen” also points to a central feature of the artist’s work: his early photographs and later videos offer us carefully crafted tensions and contradictions that hide as much as they reveal about the gloomy countrysides and bleak cityscapes they depict. After having been exhibited across the world, these images of and from Derry are brought back to their place of origin on an unprecedented scale. As a result, the derelict city streets and haunted country lanes that are implacable for a non-native of the city are now presented to audiences with first-hand knowledge of these spaces and their untold stories. In 2012, the Northern Ireland Tourist Board launched an advertising campaign across the United Kingdom and Ireland that heralded: “Our Time, Our Place” over pictures of the Northern Ireland’s rolling hills and rugged shores. Indeed, this is a significant time for Northern Ireland, but not in the romantic way that advertisers want people to believe. Fifteen years have passed since the Belfast agreement was signed between the British and Irish governments, bringing the conflict known as the “Troubles” officially to an end. What began in the late 1960s as a civil rights movement had by the early ’70s turned into an armed struggle between the British armed forces and paramilitary networks, including the Irish Republican Army (IRA). Northern Ireland’s “post-conflict” era has created a more peaceful but increasingly divided society, where the uncertainty of the future for many seems as unfixed, dark, and damp as Doherty’s photographs from the 1980s. Northern Ireland suffers from the “colonial belatedness” that Homi K. Bhabha described in The Location of Culture over two decades ago, where time seems to be out of joint. It is difficult to discuss Doherty’s practice without considering the context; Northern Ireland in general, and Derry specifically, are constantly featured in his work. This exhibition at the City Factory Gallery is spread over five rooms—two large galleries feature his photographic works and three smaller spaces contain videos. At the entrance of the first room hangs The Other Side (1988), a grainy and grey panoramic view of the city of Derry from its west bank, cut in half diagonally with a rural foreground sloping down towards the city. Above this landscape—which is both rural and urban—are the words “west is south, east is north, the other side.” Double-edged in its meaning, the statement simultaneously codes the local geography and points toward the centuries of colonialism that have spun the compass around and around, turning up down, left and right. Befitting of a city with at least two names—the official and colonial Londonderry and the colloquial and earlier Anglicization of the Irish name Doire, or Derry—the city’s landscape, and therefore Doherty’s image, are split across two sides of a river. In the most simplistic terms, society is finally separated along the binary ideological lines of Catholic/Nationalist/Republican versus Protestant/Unionist/Loyalist, dualities that are always complicated in Doherty’s practice. Here they are even implied in this particular vantage point. The Other Side seems to give us a visual overview of this city’s conflicted heritage, but the text disorients the viewer’s position, leaving us to wonder which side is which. In a more recent video work,Re-run (2002), Doherty focuses on the gap between the two sides of the city. A man in a suit with a panic-stricken look on his face is seen simultaneously running in two directions across the Craigavon Bridge. Historically the only means of traversing the city’s two sides, the bridge was frequently bombed as a result of its strategic significance. A deceptively simple set-up, the camera catches the figure from the front as well as from the back in this double projection; even a cursory understanding of the site complicates the narrative. Following a logic similar to “Our Time, Our Place,” the city of Derry has become the first City of Culture in the UK this year—a contentious title in a location where the relationship between the Northern Ireland and the UK is still fraught. Running concurrently with Doherty’s exhibition is the Tate’s annual Turner Prize, installed in a newly created gallery on a former military site in Derry. The staging of the British art prize, for which Doherty has been twice nominated, is part of a new narrative of “from Troubles to tourism” (and “troubles tourism”). While the twin themes of the City of Culture proclaim a “joyous celebration” and “purposeful enquiry,” Doherty has spent forty years of his life unsettling official and media representations of the city, undermining didacticism and spectacularization with ambiguity and paradoxes. Even as he is embraced by the establishment in both Northern Ireland and internationally, “Unseen” is an uncomfortable reminder that this is still not a peaceful place. The resources from the short-term investment in culture that the city is now experiencing will soon pass, and Derry could return to a state of social and economical exclusion that breeds dissent. Because the funding dries up next year, the temporary gallery hosting the exhibition has an uncertain future. As someone who has lived in Derry all his life, Doherty has chosen to work with two long-term supporters of his practice in the development of the current exhibition: Klassnik, who gave him his first solo show at Matt’s Gallery in 1990, and has worked with Doherty on numerous occasions, and curator and film producer Pearse Moore, who works closely with him on production through the Nerve Centre, a media and community arts organization that Moore runs in Derry. If events like the City of Culture ultimately line the pockets of businesses and private individuals, an institution like Matt’s Gallery, with its combination of public funding and commercial entrepreneurship, may seem like the vanguard of the new economy. What from the outset was a desire to present underrepresented practices and give time, support, and space to discourse and production grew over the years into a creative testing ground and support mechanism for generations of British artists such as Susan Hiller, Mike Nelson, and Richard Wilson. 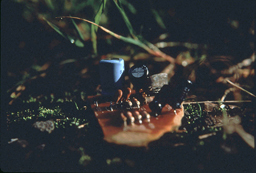 In keeping with this tradition, the exhibition traces Doherty’s work from its roots in photo-textual conceptual art to high-production video, carrying the thread of duality and ambiguity throughout. However, it is worth noting that while the more recent narratives have great affective power, Doherty’s ability to unsettle our assumptions about the structures of conflict in society create the most impact in his pairing of photographs with short poetic lines. (1) Susan McKay, “And so they are ever returning to us, the dead,” in Unseen, ed. Rosalind Horne (London and Derry: Matt’s Gallery and Nerve Centre, 2013), 9. Aileen Burns and Johan Lundh are currently running the Centre for Contemporary Art in Derry. They were just appointed co-directors of the Institute of Modern Art in Brisbane. J’aimerais voir ces caractères en argent! Il me donnerait un sens plus proche à la tristesse de Doherty et à l’ambiguïté.